At Espiritu Santo, Zane and her sistership Trever piled drums of aviation gasoline on their decks, together with torpedoes, ammunition and stores, and each with two motor torpedo (PT) boats in tow set sail for Guadalcanal. They reached Tulagi Harbor at 0530 on October 25, 1942. At 0955, the signal station at Tulagi informed both ships that three enemy ships had been sighted in the straits between Savo and Florida Islands, entering Iron Bottom Bay. Trever's commanding officer, the task group commander, Comdr. D. M. Agnew, took a dim view of the recommendation that his ships seek shelter up the Maliala River. Not wanting to be, in his words, trapped like rats, Agnew elected to run. Zane and Trever their old engines throbbing stood out at maximum speed and cleared the channel leading out of Tulagi at 1014. Lookouts noted the stacks and mast tops of three ships almost simultaneously 21,000 yards distant and bearing 250 degrees, steering a slightly converging course. 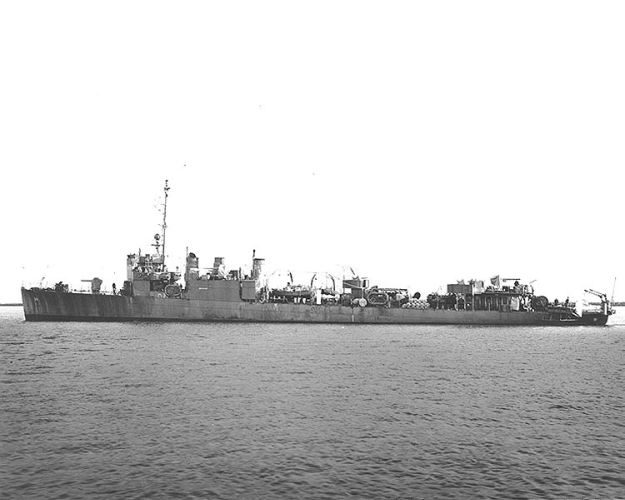 Within five minutes, the American lookouts noted that the trio of enemy ships had altered course to close. The three enemy ships the destroyers Akatsuki Ikazuchi, and Shiratsuyu comprised the 1st Attack Unit, dispatched to provide naval gunfire support during the day to Japanese land forces who had hoped to capture Henderson Field. Each of the Japanese ships with their six 5-inch guns outgunned their American counterparts who carried but five. At 1020, the enemy formation changed course again to close the range still further and bring their heavier batteries to bear. Zane and Trever, meanwhile, skirted the shoal waters on course for Sealark Channel. Ten minutes later, with the range at approximately 9,200 yards, the Japanese destroyers opened fire, and the running sea fight was on. The Japanese in view of their slated mission were using bombardment ammunition instead of armorpiercing shells. Soon shells began landing disturbingly close to the zig zagging Trever and Zane. The latter for example, observed one shell land just forward of her bow and one apiece on each side of the forecastle,off the bows. One enemy shell scored a direct hit on Zane, hitting the minesweeper's number one 3-inch mount, forward, killing three men instantly. Other shells cut away rigging, antennae, and every halyard except the one to the gaff. That one appropriately flew the national ensign.